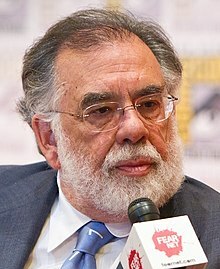 Woodside, Queens, New York, U.S.
Francis Ford Coppola (/ˈkoʊpələ/; born Aprile 7, 1939) is an American film director, producer an screenwriter. He wis pairt o the New Hollywood wave o filmmakkin. This page wis last eeditit on 30 September 2018, at 05:39.